That new Anchiornis paper is quite something, isn't it? Everyone else is talking about it, so I don't have to, but check it out if you haven't already. These previous papers have largely focused on the therizinosaur Erlikosaurus from the Late Cretaceous Bayan Shireh Formation in Mongolia, a sensible choice given that this genus has the best-preserved skull material of all known therizinosaurs. 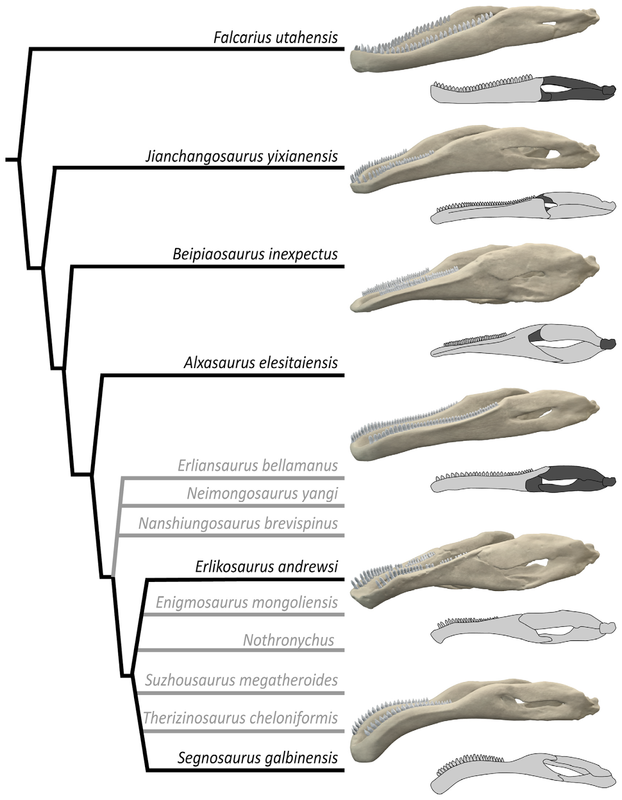 The new study, also conducted by Lautenschlager, takes the logical next step by asking: how does Erlikosaurus compare to other therizinosaurs? 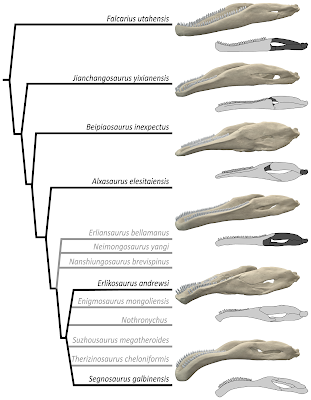 Phylogeny of therizinosaurs with digital models of the lower jaws of taxa used in the analysis, from Lautenschlager (in press). To answer this question, Lautenschlager digitally modeled the lower jaws of other therizinosaur taxa, including Falcarius, Jianchangosaurus, Beipiaosaurus, Alxasaurus, and Segnosaurus, and subjected the models to finite element analysis (FEA). Under FEA, stress (force per unit area) experienced by the jaw under different simulated feeding conditions could be calculated, as could relative bite force. The different feeding scenarios tested were biting using one side of the jaw at different tooth positions, biting using both sides of the jaw at different tooth positions, clipping using the tip of the jaw, pulling an object upwards, pulling an object downwards, and pulling an object sideways. 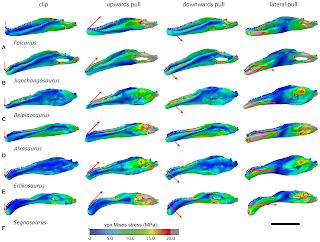 The results of finite element analysis simulating potential feeding behaviors in different therizinosaur taxa, from Lautenschlager (in press). 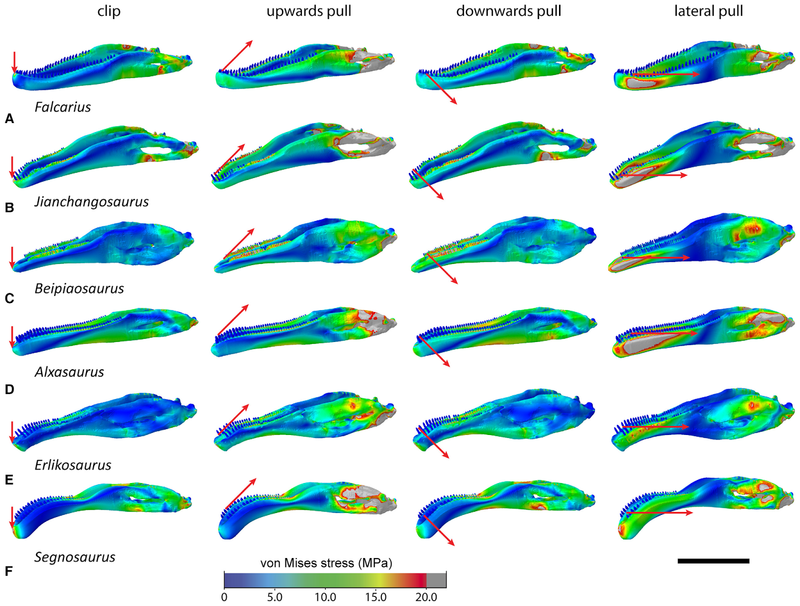 It is worthy to note that this study did not calculate the absolute bite force of these therizinosaurs, only their relative bite forces. In other words, instead of estimating how strong a bite the therizinosaurs were actually capable of generating, the study estimated which therizinosaur could generate the highest bite force if all of them exerted the same amount of force with their jaw muscles. With that in mind, what did the results say? It turns out of the taxa tested, Falcarius and Alxasaurus had, on average, the highest relative bite forces. This is consistent with the idea that Falcarius was more omnivorous than other therizinosaurs and may have still fed on some animal prey. Alxasaurus has also been interpreted as a more generalist forager than other therizinosaurs on the basis of its claw morphology, so having a relatively high bite force may have increased the variety of foodstuffs it could feed on. On the other hand, the results indicated that Falcarius and Alxasaurus would have experienced greater amounts of stress during feeding than other therizinosaurs, whereas Erlikosaurus and Beipiaosaurus would have experienced the least. Additionally, all therizinosaurs would have experienced less stress while pulling items downwards compared to pulling upwards or sideways, suggesting that they habitually fed at or above head level. However, Erlikosaurus and Segnosaurus were more suited to pulling objects sideways than other therizinosaurs. What appears to have made the difference in this case is that Erlikosaurus and Segnosaurus both had a downturned lower jaw. This is an interesting result considering that a downturned lower jaw has independently evolved in other herbivorous dinosaurs. The unusual ceratosaur Limusaurus even gained one during growth (in addition to losing its teeth)! This study confirms that such a jaw would have been advantageous for herbivores by helping to mitigate stress while feeding. A similar adaptive benefit has been attributed to the widespread presence of a beak in herbivorous dinosaurs (including therizinosaurids). Among the taxa studied, Erlikosaurus and Segnosaurus were contemporaneous with one another, suggesting there may have been niche partitioning between them. This is supported by the study: Segnosaurus had relatively higher bite forces (as well as probably higher absolute bite forces, considering its larger size) and may have been able to feed on tougher plants, but Erlikosaurus experienced less stress during feeding and may have been able to use a greater variety of feeding methods. Though not discussed in the paper, one wonders whether the same was true of Jianchangosaurus and Beipiaosaurus, both found in the Yixian Formation. Here, however, the differences are less explicit: Beipiaosaurus experienced lower stresses while feeding, but both had similar relative bite forces.